﻿ Cristiano Ronaldo: "Free-kicks are one of my specialties"
16.11.2011 » Cristiano Ronaldo: "Free-kicks are one of my specialties"
Portugal have booked their ticket for EURO 2012 last night, after a stunning 6-2 victory over Bosnia and almost inevitably, Cristiano Ronaldo was the MVP of the match. 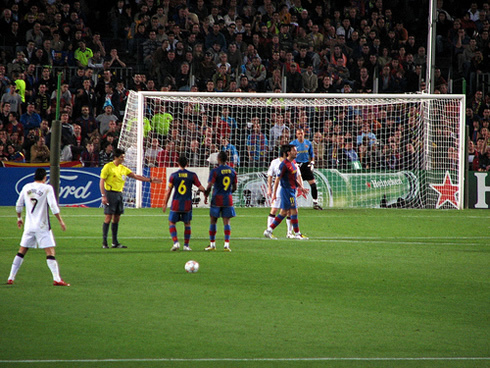 The Portuguese player opened hostilities with his trademark free-kicks (often called tomahawks) and reassured he's not worried about FIFA's Balon d'Or winner announcement, which will be revealed in January 2012. There are no doubts that Cristiano Ronaldo is one of the best free-kick takers of his generation, even though a few people insist on criticizing his lack of efficiency from set-pieces. Ronaldo scored 6 goals from free-kicks last season (2010-11), and in this year's campaign, the Portuguese phenomenon just scored his third, when accounting both club and National Team. 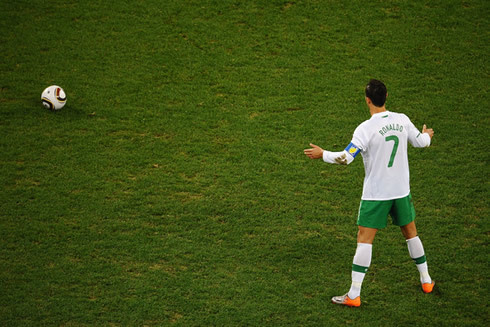 Despite the importance of the victory earned against Bosnia-Herzegovina, CR7 has also assumed that it was the team's obligation to win the match and be present in EURO 2012. Do you agree that Cristiano Ronaldo is the best free-kicks taker of this generation? Check the video below to relive and remember every single goal Ronaldo scored from set-pieces from September 2003 till May 2011. Cristiano Ronaldo: "People have already gotten used to see my scoring from free-kicks, since it's one of my specialties. My second goal was only possible due to a great assist from João Moutinho. I noticed that Bosnia's goalkeeper was leaning to his left side, so I dribbled him to the opposite side and finished the play", said Ronaldo when attempting to explain his two goals scored against Bosnia-Herzegovina, which allowed him to equalize Luís Figo in the Portuguese National Team all-time goalscorers table, with 32 goals each. A few days ago, Cristiano Ronaldo complained about Zenica's very bad pitch and turf, but this time, the Portuguese player was delighted with the grass. Ronaldo: "No doubts that this grass pitch [Estádio da Luz] is a lot a better." emphasized CR7, before commenting on what has changed within the Portuguese National Team since Carlos Queiróz left control to Paulo Bento. Ronaldo: "Our coach implemented a new mentality and brought "fresh blood" to the squad. We are all very happy with what we've made and it was our determination and confidence that allowed Portugal to qualify to EURO 2012. We are now trying to enjoy this moment for a while. With all the respect, winning to Bosnia was almost like an obligation and now we can return to our clubs with the feeling that we've done our jobs well", noted the Portuguese player. With his last 2 goals scored against Bosnia-Herzegovina, Cristiano Ronaldo reached his 52th goal of the 2011 year (combining the past and current season) and FIFA's Balon d'Or which awards the Best Player of the World in 2011, is right around the corner, in January 2012. However, that doesn't take Cristiano Ronaldo's sleep as he doesn't seem to be worried with it. Ronaldo: "I'm not thinking about that, although goals and good performances are always important for that matter. I want to keep my form in Real Madrid, because that's the only possible way that may grant me the opportunity to win things."